Hungry Japanese diners are lining up for a chance to eat “The Donald,” the newest, insanely popular “must have” culinary creation in Tokyo. Dubbed the “Trump Burger” by its creator (“The Donald” is the name I have given it), Chef Yutaka Yanagisawa, the Trump Burger is an exact replica of the meal Yanagisawa served President Trump while on his Asian tour. President Trump enjoyed the burger so much he made it a special point to commend and congratulate Chef Yanagisawa. That’s all that was needed for the trend-loving Japanese to high-tail it to Yanagisawa’s restaurant for their very own Trump experience. Not exactly McDonald’s pricing, The Donald will set you back twelve and a half bucks for the single patty, nearly seventeen for a double, but it does come with fries and coleslaw, exactly, I presume, the same way the real Donald ordered it. Now, if they can just figure out how to eat it with chopsticks. President Trump may be the most persuasive person alive. He’s not only changing politics. He’s changing how the world eats. This unique dish is so-named because it’s the same burger President Trump ate while on his Asia tour, AP reports. The $12 (1,400 yen) burger features a juicy beef patty topped with melted cheese, lettuce, and tomato. It comes with a helping of coleslaw and a side of fries. 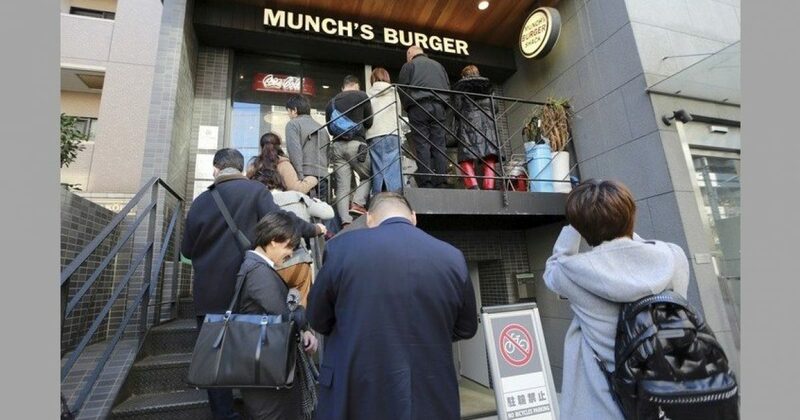 Chef Yutaka Yanagisawa, owner of Munch’s Burger in Tokyo, says the Japanese Foreign Ministry reached out to him to provide catering to the American President and an entourage of about 20 people. Yanagisawa doesn’t know why he was chosen, but says he was “honored” to have cooked the meal. He took his ingredients to the country club where the leaders were gathered and prepared the burgers under the watchful gaze of a Trump staff member. The chef says President Trump ordered his burger well-done. To avoid a “disaster,” Yanagisawa made both burgers the same in case they got mixed up. Tokyo-based food consultant Jotaro Fujii says eating out at novel restaurants and sharing pictures of the meal on social media is a popular form of entertainment in Japan. Munch’s Burger’s latest item has people waiting through long lines for the “Trump” experience. One happy customer is Haruyuki Sano, a pastry-maker who likes President Trump’s message about nations putting their own citizens’ interests above globalist interests. “It tasted great, like steak,” Sano says of the 100 percent US Angus beef Colby Jack burger. Sano is so enthralled he traveled an hour-and-a-half to get to the restaurant. Munch Burger specializes in “premium burgers,” which are becoming increasingly popular in Japan. Premium burgers tend to be twice the price of fast food burgers. Yanagisawa says he hopes to one day open a restaurant in New York, where he can show off the “handmade element” of Japanese cuisine. Maybe he can leverage his connection with the President to open up shop in Trump Tower.